Led Zeppelin thinks it’s been a long since you’ve rocked and rolled. AC/DC asserts that rock and roll ain’t noise pollution. And Neil Young claimed that rock and roll would never die. As the 2014 nominations for the Rock and Roll Hall of Fame suggest, rock is a fluid genre, one that’s not carved set in stone. On Wednesday, 16 nominees for induction into the Rock and Roll Hall of Fame were announced. The list makes a valiant attempt to encompass popular music in its entirety, from the smooth sounds of 1980s hitmakers Hall and Oates to the proggy guitar acrobatics of Yes. If you’re into rigorous definitions of genre that may be problematic, but there’s no doubt some great bands are getting their due. Louisiana R&B outfit The Meters are one of the funkiest bands ever, Peter Gabriel was the original Marilyn Manson, and the shadow of The Zombies still lingers over much of today’s indie rock. For the nomination process, more than 600 voters including industry folk, past inductees, critics, and rock historians (that’s an actual job) submitted suggestions. All artists must have released their first single or album no later than 1988, which meant that Nirvana barely squeaked in as did L.A.’s own N.W.A., the only one of this year’s nominees who created music not just in Los Angeles but about the city. Sure, some performers like the mansion-bound Kurt Cobain and Gene Simmons have been based in Los Angeles. Yes, Linda Rondstadt once lived in Laurel Canyon (fun fact: she was engaged to George Lucas and dated Jerry Brown) and surf-guitar proto-punk Link Wray sounds totally SoCal (though he lived for much of his adult life in the San Francisco Bay Area). But the guys of N.W.A. were children of Los Angeles. They began as a party crew performing electro-tinged breakdance jams at backyard bashes. Their subject matter turned darker, reflecting the realities of their lives in Compton. 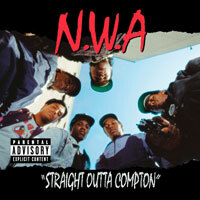 Launching the careers of Ice Cube, Dr. Dre, and Eazy-E (who died in 1995), N.W.A. solidified its status as griots of gangsta rap while creating a mythology for the culture that surrounded it. Until December 10 at 5 p.m. (ET), you can make your voice heard and vote for your picks. Below is the full list of nominees; it’ll be interesting to see if N.W.A. makes the final cut.